Business leaders are busy people. All those individuals in the “C-Suite” have plenty to do. So you would imagine that in order to provide them with insights to help them improve their aspect of business they would want something “snappy”. You’d expect them to prefer a quick blog post, or a short video, rather than having to wade through thousands of words. After all, they are so busy at this level of work – juggling several different projects – you would think they would not have the time to consider lengthy articles. But if you thought all that, you’d be wrong. According to a new study from Forbes Insights, the C-Suite executive is more interested in lengthy, written material than anything else. More than half the executives in the study wanted long articles, reports, books and briefing documents. Those are what you might call “traditional” methods of communication; they existed before the Internet. Meanwhile, blogs, podcasts, webinars, infographics only garner support from around 10% of C-Suite executives. Once again, this is further research confirming that the world of online video is not important to business decision-makers. Online video is massive. Billions of videos are watched every day. There are around 576,000 hours of video uploaded to the web each day. This would all suggest that video is important. It is. There is no denying that. But you need to dig deeper into what is being watched and who is doing the watching. Almost all online video that is consumed is entertainment or breaking news. Business video? Hardly worth a mention. OK, yes, it does have its place, such as in providing an alternative to instruction manuals and gaining the interest of consumers. There is a clear marketing value in a business video. But as a means of persuading C-Suite executives, they need to change? Forget it. Why do busy executives want long content? Given that the C-Suite team is busy, there must be a reason why they want to read long articles, reports and books. As ever, the answer can be found in thinking about psychological factors. Those working in the C-Suite have to make significant decisions. What these executives decide could make or break a company. As a result, the C-Suite individual wants to make sure they have made the right decisions. That means they are always seeking to minimise the risk of their decision making. Humans seek to minimise risk all the time. It is an inbuilt instinct that helps you survive. If you didn’t constantly analyse risk in the world around you, then you’d eat poisonous food, you would run in front of traffic and you might make foolish decisions. One of the ways we seek to reduce risk is by getting as much information on something as possible. Information is key to risk reduction and this is why C-Suite executives want long-form content. A short video contains little information, so too does your typical blog post. But a 3,000-word article, or an in-depth report? Those are things that executive can “get their teeth into”. When you get something in the post and it is a flimsy letter, you take little notice of it. But if it is a thick packet, that “thuds” onto your doormat as it lands, you pay more attention. Several studies have shown, for instance, that a 14-page sales letter achieves more take-up than a similar 7-page sales letter. One of my friends in a pharmaceutical company thought he would try to save money by reducing margins and lowering the font size on his reports. They still looked OK but had almost half the number of pages of previous reports. The total content was the same, in terms of word count, but his colleagues were less impressed. His reports didn’t look as substantial as his previous ones and his colleagues felt they were being deprived of information. They wanted a report that “seemed” longer simply because their psychological instinct for as much information as possible was kicking in. True, these days people are busier and do not want to read too much. But they still want to read a lot. The average length of a best-selling book is still 273 pages. It used to be 467 pages back in 2011. However, we are now buying more books than ever before, so our total consumption of pages has gone up. It all continues to point to that psychological desire for risk reduction by gaining as much information as possible. If you want to reach business leaders, those individuals who have a job title that is an acronym beginning with “C”, then you need to present them with as much information as possible. Far from putting them off with the amount of material to “wade through” you will be triggering their information desire, all part of their risk reduction instinct. Each of these is the type of long document that will be preferred by the C-Suite. If you really must record a video, then do a short promotional recording to bring people’s attention to your long document. It may seem counterintuitive. While everyone else is rushing headlong into video or podcasting, you might think it is daft to go back to something so traditional and old-fashioned as a written report. Yet the research continues to confirm this is what is necessary. Two years ago there was research which suggested that writing was more important than video online. Three years ago, another study demonstrated the need to focus on text. 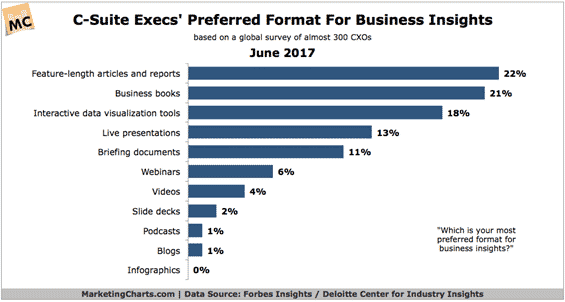 Now, with this new study from Forbes, it is further evidence that business executives want long articles and lots of text. That’s not because they are old-fashioned or out-of-date or not “on trend”. Rather, it is their psychological desire for reducing risks that is kicking in. So what do you need to do now? Get writing…! What do business people want? Detail, not pictures Business buyers are interested in detail, lots of it. Forget video, social media and podcasts. What business buyers want is specific written information. This is very interesting Graham. In my mind C level execs will spend time reading content from authors that they trust. For trust to build awareness needs to be won as a first step. Is there a place for shorter punchy content at the top of the awareness funnel would you say? That’s a possibility, Nick. But also they will read lengthy material from people they don’t know, later looking for signals of trust such as social media activity (particularly LinkedIn), blogs and videos. It might be the other way round to what you are suggesting. People seek to reduce risks first and then find signals of trust afterwards. Awareness of the content is good, but awareness of the author is not so important.